Alycia and Shadowfax enjoy some low level chomping time. 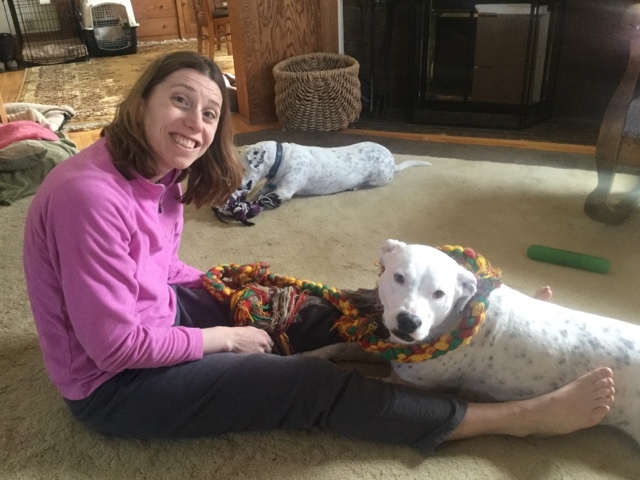 Shadowfax loves to snuggle while she destroys toys and play tug-of-war, so the Extra Large 6-Foot Long Rope Toy (Amazon link here) is perfect for her. It's also long enough that it prevents hands and fingers from being accidentally subjected to a wayward chomp. We're big fans of these rope toys and get a new one once or twice a year, since eventually they get shredded and beat up. Through it all, Shaak Ti is pretty content just to sit and chew on her "Crazy Eight" rope toy (Amazon link here). Shakk Ti is a simple gal, she's happy with a toy that can be meticulously disemboweled or slowly pulled apart, thread by thread. This is a pretty standard afternoon scene here at the household. We've had our outside play time, a nice walk, and some dinner. This is the wind down stretch, where we expend a little bit more energy and see if some snuggling develops (it usually does).